Ecoult’s Indian expansion is the first step in building a global manufacturing network. Australian advanced lead-acid battery maker Ecoult says this month’s expansion into India is the first step in creating a global manufacturing network. At the same time, the company is hoping to “significantly improve performance” and halve the cost of deploying its products for an unspecified number of applications, Wood said. “I’m looking to be a cost leader,” he commented. Ecoult is stepping up its international ambitions on the back of five years of field experience with its UltraBattery technology, which is billed as a hybrid between a lead-acid battery and a supercapacitor. Currently, most of the company’s installed base, which equates to around 12 megawatts and 12 megawatt-hours, is evenly distributed between many kilowatt-scale commercial and industrial installations in Australia and fewer, larger plants in the U.S., Wood said. One example of the latter is a 3-megawatt storage system that has been providing regulation services on the PJM Interconnection grid since 2012. Ecoult has also provided a 250-kilowatt, 1 megawatt-hour UltraBattery Energy Resource system for solar smoothing at PNM’s Prosperity PV plant in New Mexico. The installation has been running since 2013. Ecoult debuted in the European market last year with a Dublin, Ireland-based project carried out in association with German power converter maker Freqcon for an Irish smart grid testbed. Until recently, Wood said Ecoult was cautious about promoting its products too heavily, pending the availability of long-term performance data from the field. Experience gained over the last half-decade shows that even with the earliest UltraBattery products, which lack many of the refinements of newer models, “we’ve still only replaced a small number of batteries,” Wood said. This experience gave Ecoult’s 38-person team the confidence to go big on global markets. Earlier this month, Australia’s top clean-energy funding body, the Australian Renewable Energy Agency (ARENA) committed a AUD $4.1 million (USD $3.2 million) recoupable funding package to “help Ecoult deliver on both its local and global objectives,” according to a press release. The funding followed the signing of a deal between Ecoult and Exide Industries, India’s largest battery manufacturer, to produce UltraBattery units for the Indian and South Asian markets. Wood said he expected to see the first UltraBattery units rolling out of Exide’s India plant within nine months. He also said Ecoult was looking to close similar deals elsewhere, likely starting with other developing markets where the UltraBattery’s technical capabilities would allow it to compete with existing lead-acid chemistries. Ecoult claims the UltraBattery offers higher charge and discharge rates than traditional lead-acid batteries. It also claims better performance at partial state of charge, reduced sulfation, longer lifespan and an efficiency usually well above 90 percent, versus lead-acid’s 85 percent or so. In 2012, tests by Sandia National Laboratories revealed the UltraBattery could run for more than 20,000 cycles without significant loss of capacity. The technology, which was originally developed within Australia’s Commonwealth Scientific and Industrial Research Organization in 2007, is also non-combustible and, like other lead-acid batteries, fully recyclable. 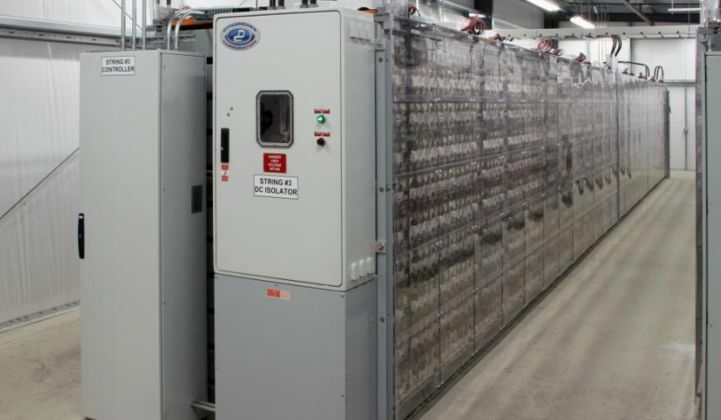 Pennsylvania-based East Penn, which owns the Deka brand and operates the world’s largest single-site lead-acid battery factory, bought Ecoult in 2010 and now makes UltraBattery units at its Lyon Station manufacturing facility. Three years after the purchase, ARENA pumped AUD $583,780 (USD $449,260) into Ecoult to help optimize the UltraBattery for off-grid applications through the development of a kilowatt-scale version dubbed the UltraFlex. The latest ARENA cash injection is notable for its focus on commercialization outside Australia, since the funding agency is usually known for supporting the development of projects on national soil. “This gives us scope to build on Australia's rich history of invention by helping local companies develop world-leading renewable energy solutions, which when commercialized will be able to compete in export markets," said the agency's press team.